It was a much anticipated matchup as two undefeated teams were set to face off at Cy Sloan Stadium last Friday night. Waurika and Snyder were both undefeated and the Cyclones were coming off a big win over rival Tipton. Waurika had mercy-ruled each of its first three opponents by halftime of each contest. But because of about five inches of rain that fell in the area last Friday and concerns about fans getting into and out of the stadium area, the game was canceled and will not be played. Of course there was concerned about the playing conditions of the field and trying to prevent injuries as the two teams look forward to district play. The Eagles get back in action tomorrow night by making the long trip to Caddo to face the Bruins in the final non-district encounter. Kickoff is set for 7:30 p.m. at Bruin Field. Caddo will come into the game with a 2-2 mark and some momentum having won two in a row including last Thursday’s 57-26 victory over Ryan. In the win over Ryan the Bruins came within just over a 100 yards of eclipsing the total number of yards on offense in the three previous games combined. The Bruins recorded 502 yards of offense against the Cowboys and had only a little over 600 yards of offense in the previous games. Senior quarterback Jack Holbrook was outstanding the contest against Ryan with five touchdown passes and was 13 of 18 passing for 230 yards. The favorite target for Holbrook against Ryan was Payton Brewer, a senior wide receiver. He had three catches for 85 yards, including a 60-yard touchdown pass from Holbrook. Another senior, running back Michael Creel rushed for 110 yards on just 15 carries and one touchdown. 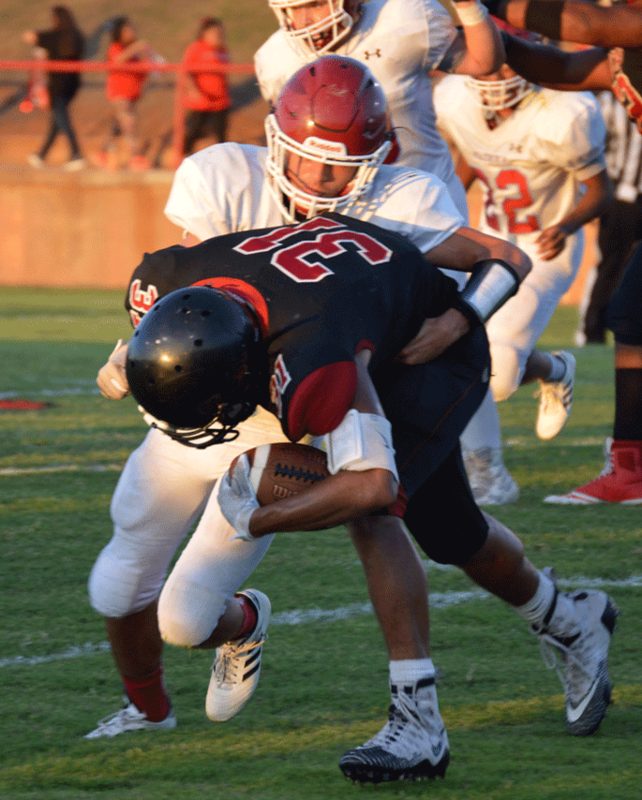 The Waurika defense will be tested in the contest as Caddo averaged over eight yards per offensive play against Ryan. Caddo features a 23-player roster and eight of those players are seniors. The Eagles, however, should be well rested for the game and the unexpected break in the schedule. It was a good week for the grid teams in District B-4 as four of the five schools won their contests as they continue to engage non-district foes. This week the teams will engaged in another week of non-district contests while most of the rest of the state begins district play. Most districts in all classes have eight schools, but the schools in District B-4 are with five other schools leaving more room for non-district games. Wilson will take the week off, but the Eagles have fashioned an impressive 4-0 record to start the season. They have wins over two ranked teams in Class C – Fox and Paoli. Wilson’s victory over Fox was probably the most impressive among the district schools. Waurika is the other undefeated team among the district schools with wins over Temple, Grandfield and Carnegie – all by the mercy rule. Ryan recorded its third win of the season and all three wins have come against Class C teams – Maysville, Temple and Grandfield. 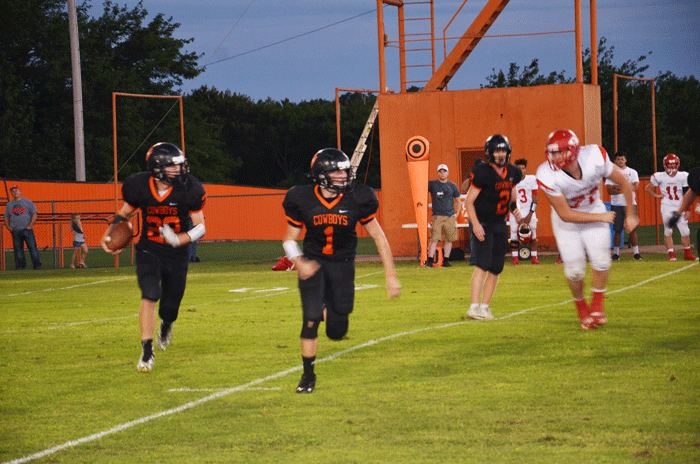 The Cowboys will step back into play against Class B teams when they face Caddo this week. Bray-Doyle, 3-1 on the year, will have the week off, also. The Donkeys had been on a roll until last Friday when they were soundly defeated by Cyril, 52-6. Central High got into the win column for the first time this season. The Bronchos defeated Temple but both schools suited out only 10 players for the game. Empire, who had a bye week last week, will try to reach the .500 mark when they host Cyril. 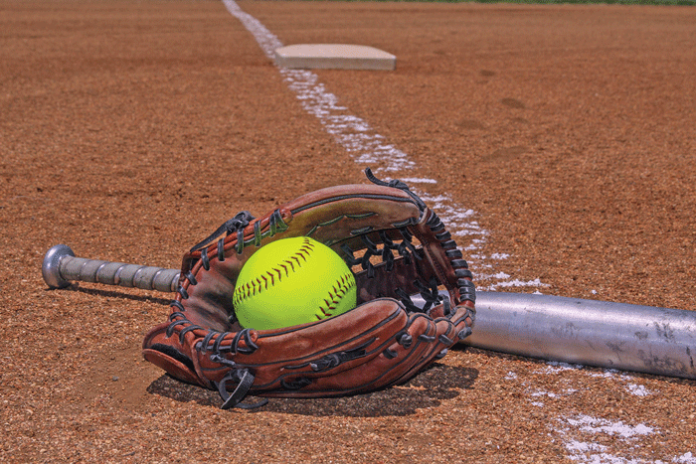 It has been a rough season for the youthful and inexperienced Waurika fast-pitch softball squad. 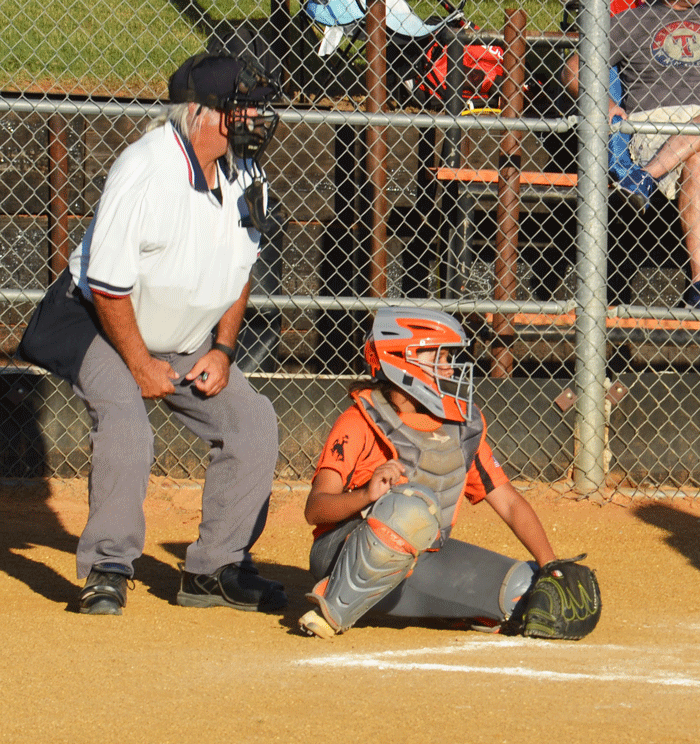 But, the Lady Eagles suffered their narrowest defeat of the season to Bray-Doyle, 10-8, Monday on the Lady Donkey’s home diamond. The Lady Eagles were to have met Temple Tuesday. Today Waurika begins play in the Class A District Tournament at Ringling. The Lady Eagles were to have met Wilson at 12 noon today and the loser of that game was scheduled to face Ringling at 1:30 p.m. The winner of the first game was scheduled to meet Ringling at 3 p.m. The tournament is double-elimination with the championship game scheduled for 4:30 p.m. today and an “if necessary” game at 6 p.m. In Monday’s action, the Lady Eagles spotted Bray-Doyle an 8-0 lead after the third inning. In the top of the fourth, the Lady Eagle’s bats came alive. Gracie Walling reached on an error and scored on Kaci Reynold’s RBI-single. Madison Roberson, who singled and Reynolds scored on Landry Forsyth’s double to center field. Tallin Mora also singled and eventually scored on Hope Cummings’ ground out cutting the Bray-Doyle lead to 8-4. The Lady Donkeys extended the lead to 10-4 in the bottom of the fourth and that proved to be the difference in the game. Waurika refused to give up despite the deficit. Faith Roberson led off the rally with a triple and scored on Walling’s single to left. M. Roberson and Reynolds singled with Walling scoring on Reynolds’ single. M. Roberson scored on Mora’s ground out and Reynolds crossed the plate on Forsyth’s single to cut the margin to 10-8, but the rally ended with a fly out. In the second game of the three-way meeting at Bray, Ninnekah got off to a 1-0 lead after scoring in the top of the third. Ninnekah added five more runs in the top of the fourth inning to move in front, 7-0. The Lady Eagles managed two runs in the bottom of the fourth. Destiny Barnes singled and advanced to third on M. Roberson’s single. Barnes scored on an error and M. Roberson scored on a wild pitch. 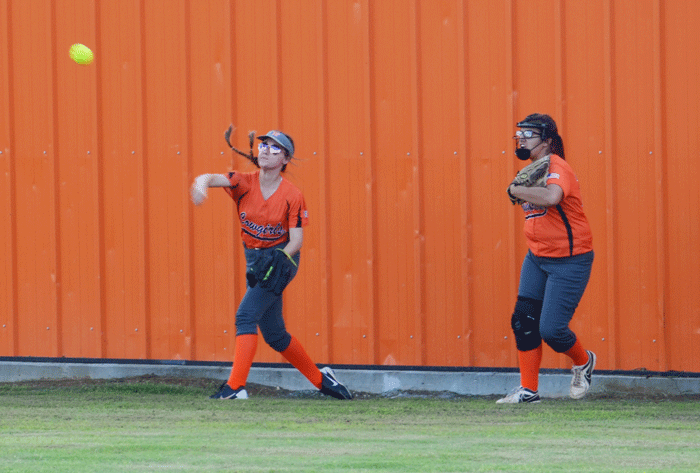 After holding Ninnekah scoreless in the top of the fifth, the Lady Eagles got a one-out single from F. Roberson, but the next two Lady Eagles were retired to end the game. The fast-pitch softball season has not gone quite as expected for Coach Stan Mueggenborg’s Cowgirls. But, as the Cowgirls get ready to enter district competition every team starts with a 0-0 mark. The winner of the district tournament will advance to next week’s regional tourney. This year’s district tournament is today (Thursday) at Thackerville and will include the host school, Turner and Ryan. Ryan, 6-14 on the year not including Tuesday’s scheduled game with Springer heading into the tourney, was slated to take on Thackerville today at 12 noon. The loser of that game was to have played Turner at 1:30 p.m. The winner of the first game was to have met Turner at 3 p.m.
Only Thackerville comes into the tournament with a winning record at 11-8 not including last Tuesday’s scheduled game. Here is a look at the results for the Cowgirls last week including three games in the Comanche Tournament the game a week ago Tuesday against Waurika as well as Monday night’s contest. On Monday the Cowgirls hosted Temple on Larry Ninman Field and came away with the victory that should give the Cowgirls a bit of momentum heading into today’s district tourney. Temple got on the board in the top of the first with a single run, but the Cowgirls took the lead in the bottom of the first after two were out. Brooklyn Charmasson and Sadie Guzman each reached base and came around to score putting the Cowgirls in front, 2-1. The score stayed that way until the top of the fourth inning when Temple got a run to tie the score at 2-2. The Cowgirls then exploded for 10 runs in the bottom of the fourth to seal the victory. Madison Rhoades led off the inning with a walk and scored. The next three Cowgirl batteres reached base to set up Kodi Duke’s grand slam to center field that put the Cowgirls comfortably in front, 7-2. The Cowgirls scored five more runs and the game ended when Ryan reached the 10-run advantage. Emilee Martin picked up the win in the circle for the Cowgirls and also had two hits in the game. 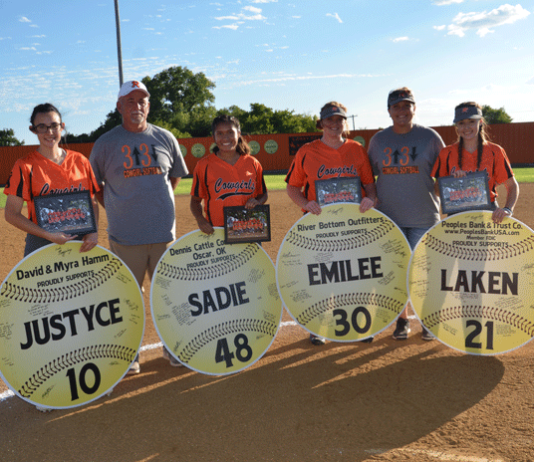 Guzman, Martin, Justyce Keith and Laken De Board were honored on Senior Night in their final home game for the Cowgirl fast-pitch squad. In the final game of the Comanche Tournament last Saturday the Cowgirls fell to Marietta, 7-0. Marietta scored one in the first, one in the second, two in the third and four in the fourth to record the victory. The Cowgirls had a threat in the top of the second inning as Charmasson and Duke reached base, but the Cowgirls could not produce a run. The Cowgirls only collected one other hit the rest of the game that was ended in the top of the fifth inning. In the second game of the tournament last Thursday, Ryan jumped out to a 2-0 lead after the top of the first inning. Samantha Good and Charmasson had base hits and came around to score for the Cowgirls. Wilson tied the game in the bottom of the first inning and then exploded for seven runs in the bottom of the second inning to hold a 9-2 advantage. In the top of the third, the Cowgirls produced two more runs as Guzman and Martin reached base and scored on Duke’s base hit to cut the lead to 9-4. The Cowgirls left the bases loaded in the inning. Good led off the top of the fourth inning reaching base on a hit by pitch, but the next three Cowgirls went down in order and the game ended because of the time limit. In the opening game of the tourney, Ryan held a 1-0 lead after one inning. The Cowgirls’ Charmasson got a base hit and scored after the Cowgirls got three straight hits. Ryan again left two runners on base. Bray-Doyle took the lead in the top of the second with two runs. The Cowgirls tied the game in the bottom of the third inning when Duke reached base on an infield hit and came around to score. In the top of the fourth, the Lady Donkeys took the lead for good with two runs. Bray-Doyle added an insurance run in the top of the fifth and the Cowgirls could get nothing going in the final two innings. 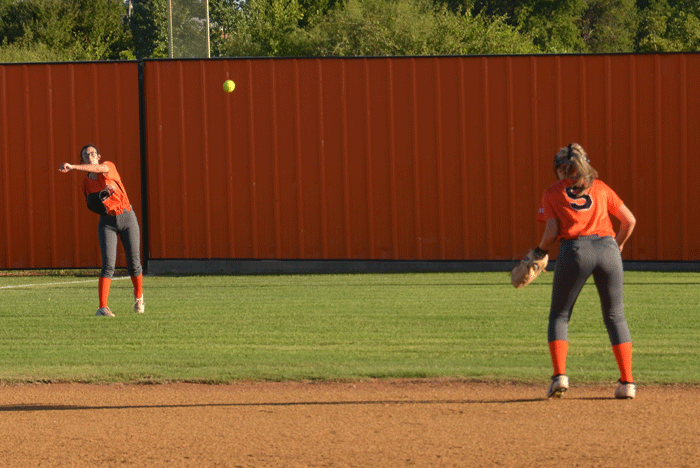 Spurred by some heavy hitting, the Cowgirls picked up the victory over the Lady Eagles in a game that ended after four innings because of the run rule. A single by Martin drove in Charmasson, who had reached on a base hit, and moved Guzman to third after Guzman had walked. Guzman scored by stealing home to put the Cowgirls in front, 2-0. Ryan left the bases loaded in the inning. The Lady Eagles threatened in the bottom of the first as Destiny Barnes and Madison Roberson got two-out base hits, but Ryan got a ground out to end the inning. Ryan added five runs in the top of the second. After one out, Carter Combs walked and Good followed with a two-run home run to left. Charmasson singled and Guzman slammed a two-run homer to put the Cowgirls in front, 6-0. Martin followed with a single, Duke singled and Martin scored on an error, but Waurika managed to retire the Cowgirls as they again left the bases loaded with a 7-0 lead. Again the Lady Eagles got something going in the bottom of the second with a walk and two singles, but Waurika left all three runners stranded. The Cowgirls put the game out of reach in the top of the third inning with four more tallies. Three straight walks loaded the bases and Duke tripled to right center and then scored when the Lady Eagles made a throwing error getting the ball in from the outfield. The Lady Eagles got another hit in the bottom of the third, but the Cowgirls got three ground outs to prevent Waurika from scoring. Avery Howard and Combs picked up base hits in the top of the fourth for the Cowgirls, but Ryan could not get a key hit and ended the inning without scoring. In the bottom of the fourth, Waurika was retired in order to end the game. Charmasson and Martin each had two hits and Duke, Charmasson and Guzman each had a pair of runs batted in. 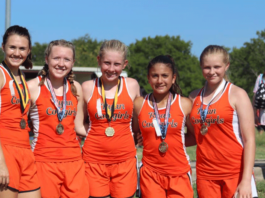 The ninth-ranked Ryan Cowgirl cross country team dominated the small field last Thursday at the Waurika Invitational Cross Country meet. In an even smaller field, the Waurika boys took the team title, but were the only school with enough runners to figure into the team scoring. Only 26 runners participated in the high school boys division. 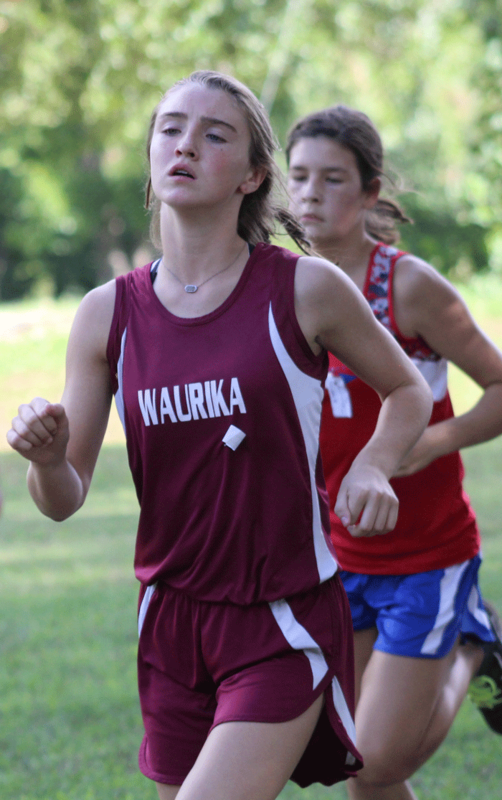 In the girls’ competition, Waurika finished second with 57 points – well behind Ryan’s 28 points. 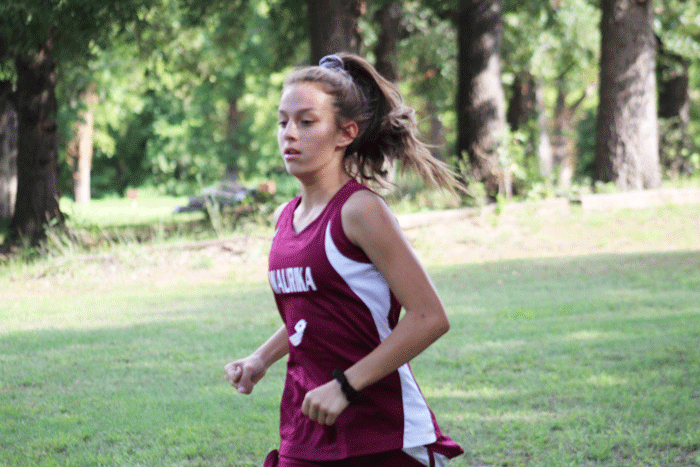 Velma-Alma was third with 58 points and Lone Grove and Davis rounding out the field. Both schools were to have participated at Walters on Tuesday. Waurika will travel to Cache Saturday for a meet, while Ryan will be back in action on Tuesday at Velma-Alma. The Cowgirls were able to capture the title with the top five runners finishing in the top ten of the 46 competitors. Juliet Spangler was fourth with a time of 13:45, which is her career best over a 3,200-meter course. Holland Carter was fifth for the Cowgirls with a time of 13:56 and Lilybet Harmon finished sixth with a time of 14:05. Lily York was right behind in eighth place recording a time of 14:18. Katelyn Dabbs rounded out the team points with a 10th-place finish covering the course in 14:22. Alicen Williams also earned a medal for the Cowgirls with a 23rd-place finish and a time of 16:13. The second-place Lady Eagles were led by Asia Smith’s second-place finish. She recorded a time of 13:42. Lexie Streeter was seventh with a time of 14:15. Three other lady Eagles brought home medals – Tallin Mora in 17th place with a time of 15:35, Dallas Fristoe in 18th place with a time of 15:41 and Faith Roberson in 24th place with a time of 16:41. 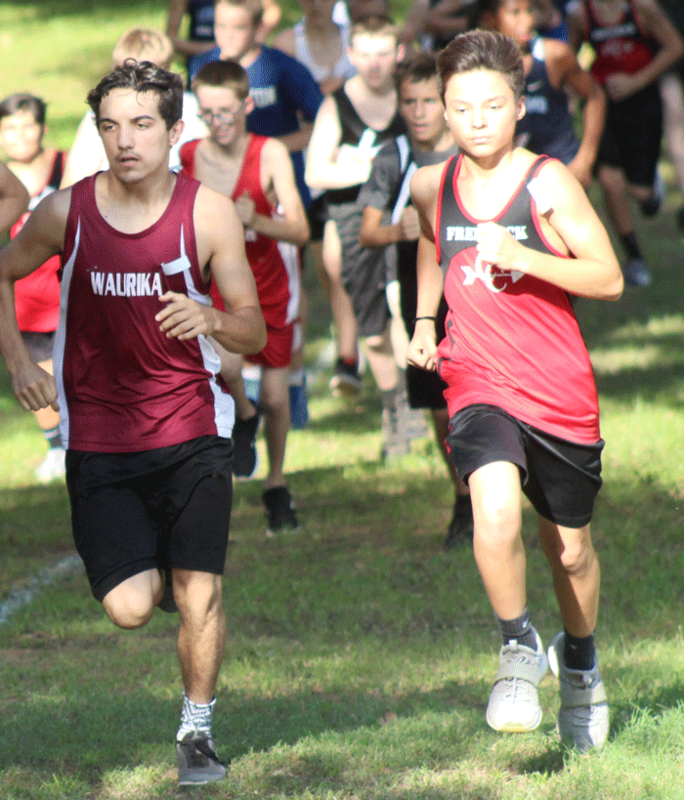 Waurika’s boys were equally impressive as they had four runners finish in the top eight among the 26 runners. Bryson Hernandez led the way for the Eagles with a third-place finish in a time of 19:57 across the five kilometer course. Cache Arellano was fifth with a time of 20:58 and Kevin Garcia managed a sixth-place finish with a time of 21:02. 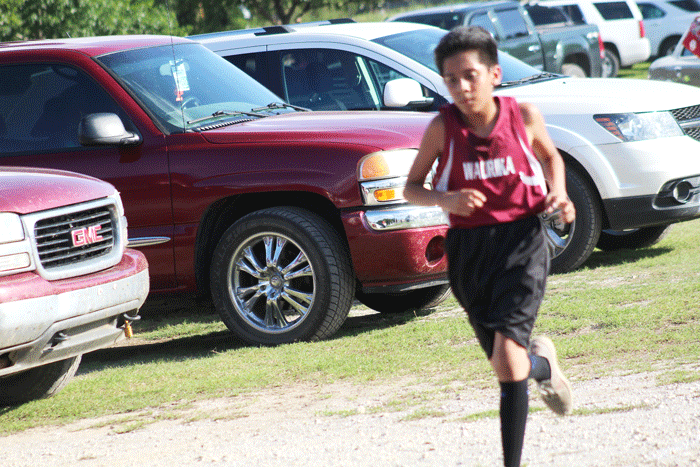 Gustavo Gomez rounded out the top ten finishers for Waurika by finishing eighth with a time of 21:20. Three other Eagles earned medals in the meet – Octavio Gomez (13th, 22:12), Edwin Garcia (15th, 23:18) and Nicolas Alvarado (23rd, 26:46). 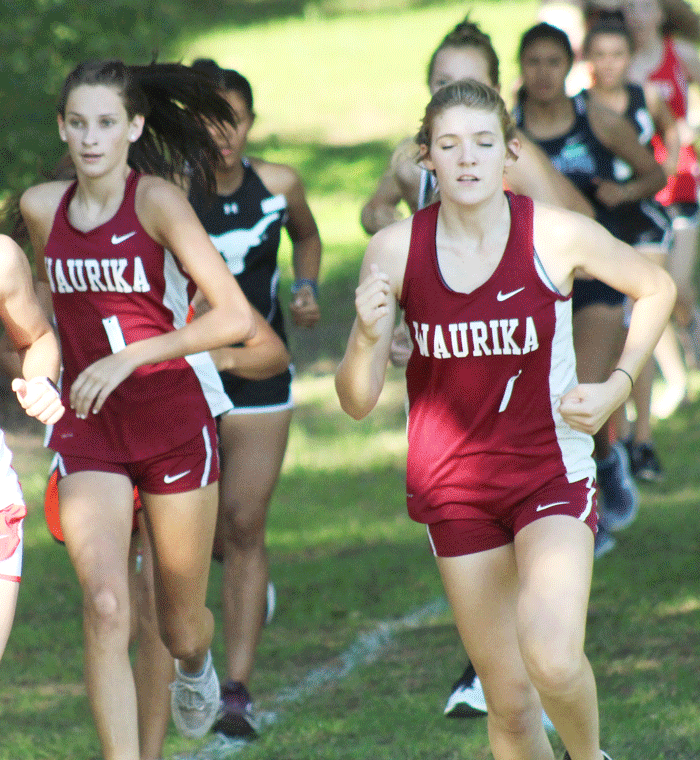 Waurika’s junior high girls also won the team title with 48 points – just ahead of Rush Springs who finished with 60 points. 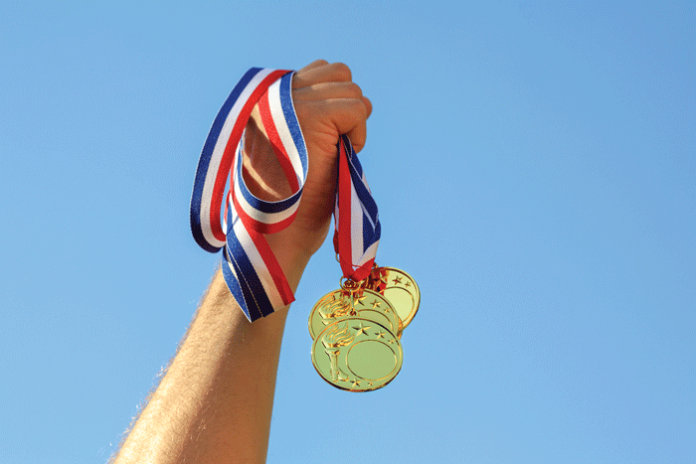 Seven teams competed for the team title. Ryan did not have enough girls to figure in the team competition. A total of 67 runners competed in the junior high girls division. The Ryan junior high boys earned runner up honors in the meet. Geronimo won the title with 47 points, while Ryan finished with 64 points. Bray-Doyle, Healdton and Frederick were the other schools with teams. The field included 48 competitors. Girls: 4. Aubrey Showalter, 10:46; 10. Liberti Simmons, 10:59; 11. Jaci Gholson, 11:09; 15. Kynlee Waters, 11:15; 24. Trish Julian, 11:48; 42. Skylar Garrett, 13:28; 50. Corley Coffin, 14:30; 53. Tracy Ballard, 15:15. Boys: 12. Treyton Torez, 14:24; 13. Alex Gomez, 14:27; 14. Trent Arellano, 14:32; 32. Malachi Dodson, 17:01. Girls: 20. Jasmine Villarreal, 11:34; 21. Whittney Spangler, 11:34. Boys: 5. Julian Rodriguez, 13:19; 16. Mason Adsit, 14:49; 21. Tommy Self, 15:32; 30. Alex Uribe, 16:43; 34. Landen Alexander, 17:15; 48. Adam Lopez, 20:58. It was quite a show of offense last Friday night at Bob Givens Sports Complex by Ryan and Maysville. It just did not result in a lot of points. The Cowboys, however, had just enough firepower to record a 30-14 victory over the Warriors in Ryan’s homecoming game. Now the Cowboys hit the road for the third time in four games as they travel to Caddo tomorrow night. Kickoff is set for 7:30 p.m. Caddo is 1-2 on the year. The Cowboys rolled up 453 total yards in the game but turnovers and the inability to convert two-point conversions kept the Cowboys from lighting up the scoreboard. The Cowboy defense came up with a few big plays to thwart a number of Maysville scoring threats to help Ryan earn its third victory of the season. The Cowboys scored on their opening drive of the game marching 70 yards on seven plays. Skyler Parkhill covered the final four yards for the score. The two-point conversion failed, but Ryan held a 6-0 lead with 9:34 left in the first quarter. Maysville threatened to answer the Cowboys’ score, but the Warriors’ drive bogged down after a delay of game penalty and a nine-yard loss on a quarterback sack by Parkhill on a fourth down play from the Ryan 28. The Cowboys took over at their own 37 and it took Ryan only two plays to score. Parkhill picked up seven yards and then sophomore quarterback Grayson Tomberlin had a nifty 56-yard run for the score. The two-point conversion failed, but Ryan held a 12-0 advantage with 3:51 to play in the first period. On the ensuing kickoff the Cowboys perfectly executed an onside kick as Andrew Villerreal combined to kick the ball and recover the onside kick giving Ryan possession at midfield. It took Ryan seven plays to drive to the Maysville 33 and that is when the game’s momentum slipped from the grasp of the Cowboys. Talented Maysville quarterback and defensive back Gunner Aprill picked off an errant Tomberlin pass and returned the interception 41 yards to give Maysville possession at the Ryan 48. The Warriors drove the ball deep into Ryan territory, but Tomberlin picked off a pass in the end zone to keep the Warriors off the scoreboard. The Cowboys turned the ball back over the Warriors just two plays later on a mishandled exchange and this time Maysville took advantage. On the first play of the drive, Aprill scampered 24 yards for the touchdown and also ran for the two points to cut Ryan’s lead to 12-8 with 7:30 left in the first half. Ryan answered the score with a seven-play, 63-yard scoring drive. The big play of the drive was a 42-yard completion to Parkhill that gave the Cowboys a first-and-goal at the Warrior seven. After a loss and a 10-yard penalty, Kalen Weldon picked up 16 yards on a counter and then Tomberlin found Parkhill across the middle of the end zone for a four-yard touchdown pass. Again the Cowboys failed to convert the two-point try, but led 18-8 with 3:33 left before intermission. Maysville answered the Cowboy score quickly. A 25-yard kickoff return put the Warriors in business at the Ryan 45 and in just three plays went the distance for the score. Aprill found Damon McCallister behind the Cowboy defense for a 47-yard touchdown pass. The try for two failed, but with 2:02 left before the half the Warriors had trimmed the lead to 18-14. The Cowboys threatened to score again by driving to the Maysville 25, but the Warriors intercepted another pass in the end zone to turn back the Cowboys and the half ended with Maysville running out the remaining seconds. On Maysville’s opening drive of the second half Aprill took the Warriors from their own 36 to the Ryan 32 as he carried the ball on every play with the exception of one pass incompletion. Ryan stopped the Warriors on fourth down and took the ball over on downs. The Cowboys took 11 plays to move 72 yards with Weldon’s key 21-yard spectacular catch keeping the drive alive on a fourth down. Parkhill went around left end for the final 12 yards and Ryan held a 24-14 lead with 4:03 left in the third quarter. Maysville went on another long drive and moved the ball to the Ryan 23, but on fourth down Villerreal chased down Aprill for a six-yard loss that gave the Cowboys the ball on downs. On the third play of the drive Tomberlin found Parkhill open on the left side and after the Cowboy senior dodged a couple of tacklers, he sprinted 71 yards for the score with 9:00 left in the game. The run for two points failed again, but Ryan was in front, 30-14. Two of Maysville’s final three drives resulted in the Cowboy defense getting key stops on fourth downs to help preserve the victory. Tomberlin and Parkhill accounted for most of the 453 total yards on offense for the Cowboys. Parkhill set the school record for most yards receiving in a game with 189 yards on just seven receptions. He also rushed six times for 30 yards. Tomberlin finished with 151 yards rushing on 19 carries. He was 12 of 20 passing for 249 yards, but he did have three interceptions. On defense, Tomberlin and Parkhill played big roles. Tomberlin was in on 17 tackles on the night, while Parkhill added nine stops. Villerreal, who had 11 tackles, and Parkhill put pressure on the Maysville quarterback much of the night. COWBOY CORRAL: The win broke a two-game losing streak in homecoming games for Ryan not including last year’s homecoming game with Grandfield which Ryan won by forfeit…..Ryan now leads the short series with Maysville, 4-2….This was the first meeting between the two schools in an eight-man game….The last time Ryan played Maysville was in 1975 with the Cowboys coming away with a 9-6 victory….Tomberlin’s passing performance was the sixth most yards passing by a quarterback in school history….It was also the sixth most passing yards by a Cowboy team in school history….The 12 receptions in the game ties for the ninth most in a single game in school history along with the 12 receptions in a 1940 contest with Grandfield…The 30 points scored by Ryan is the second most in the series with Maysville just behind the 34 points scored in a 34-0 victory by the 1974 squad….The 1988 Ryan Cowboys, the first Ryan football team to play for a state title, were introduced at halftime along with coaches Phil Elerick and Gordon Garner. MAYSVILLE – Rushing: Aprill 35-166, Bentley Stevens 3-22, Junior Simmons 6-12, Luke Dobson 2-9, Jacob Owen 1-7, McCallister 2-2; Passing: Simmons 0-2-0-0; Aprill 2-4-77-1; Receiving: McCallister 2-11. RYAN – Rushing: Tomberlin 19-151, Parkhill 6-30, Kalen Weldon 1-16, Travis Fristoe 1-8, Gunner Phillips 2- -1; Passing: Parkhill 0-1-0-0; Tomberlin 12-20-249-3; Receiving: Parkhill 7-189, Weldon 2-48, Fristoe 1-10, Andrew Villerreal 1-5, Phillips 1- -3; Tackles: Tomberlin 17, Villerreal 11, Parkhill 9, Weldon 7, Justin Williams 5, Walter Snider 4, Gunner Phillips 3, Trey Bryant 3, Pacen Wiest 3, Sam Brown 2. 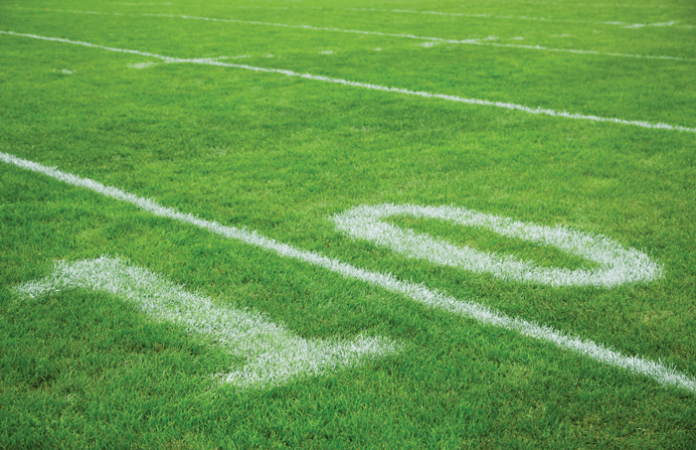 A high school football game can quickly get out of hand when one team is making turnovers. And, that was the case last Friday night as Waurika rolled to a 64-14 victory over Carnegie on the Wildcats’ home field. Austin Dyer is handling kick-off responsibilities this season. 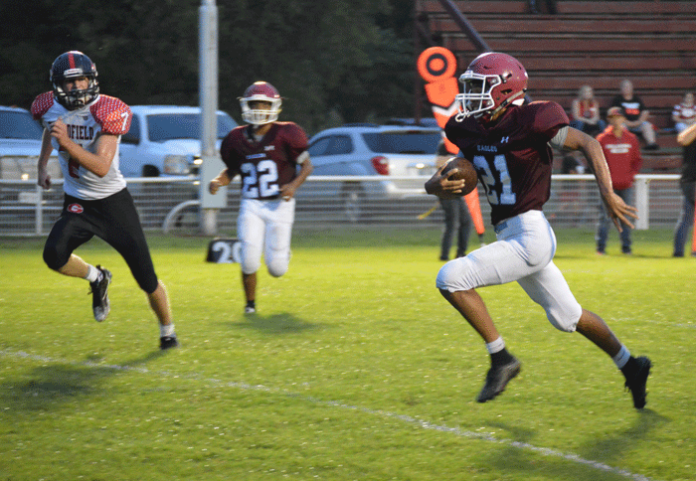 Carnegie made six turnovers in only one half of play and Waurika returned two of the miscues for scores to propel the Eagles’ to their third straight win to start the season. Waurika will face its biggest test of the season thus far tomorrow night when Snyder comes to Cy Sloan Stadium. Kickoff is set for 7:30 p.m. The Cyclones are ranked 10th in Class B and scored a big 34-24 victory over Class C juggernaut Tipton. Snyder is 4-0 on the year. Waurika got its scoring parade started in the first quarter as Colton Bryant scored on a six-yard run. The two-point conversion failed leaving Waurika in front, 6-0, with 7:23 to play in the first quarter. The Eagles got two more scores before the end of the first quarter on touchdown passes. The first TD pass came as quarterback Turner Mora found Hunter Wesberry for a 27-yard scoring pass. Mora ran for the two points and Waurika held a 14-0 advantage with 3:57 left in the first quarter. Waurika picked up the first of four interceptions on the night on Carnegie’s next drive as Bryant picked off the pass and returned it to the Wildcat 12. In just two plays the Eagles covered the short distance with Mora finding Bryant on a 10-yard touchdown pass. The two-point conversion failed, but with 2:09 still to play in the first quarter Waurika had put together a 20-0 lead. The Wildcats tried to stay up with the Eagles as quarterback Xavier Nesahkluah hit Kaden Akins on an 11-yard touchdown pass overcoming two penalties on the drive. Nesahkluah tossed the two-point conversion to Andrew Cano and Carnegie had narrowed the gap to 20-8 with 10:53 left before the half. On the ensuing kickoff, Mora took the ball at the Eagle 30 and raced 75 yards for the score. The try for two points failed, but Waurika had increased the lead to 26-8 at the 10:42 mark of the second quarter. Carnegie answered with another score on the Wildcats’ next drive – a six-play, 69-yard drive. Nesahkluah threw his second touchdown pass of the game – this time to Cano – from 10 yards out. The try for two failed, but with 8:22 left before intermission Waurika’s lead was cut to 26-14. This is when the wheels began to fall off for the Wildcats and the Eagles pounced on the opportunity to put the game away. Hunter Wesberry intercepting a Carnegie pass. On Waurika’s first play after the kickoff, Zac Brown broke loose for a 55-yard scoring run and after Mora added the two-point conversion Waurika increased the lead to 34-14 with 8:06 left in the quarter. Waurika’s defense got in on the scoring onslaught just 21 seconds later as Wesberry picked off an errant Wildcat pass and raced 36 yards on the return for the score. Bryant ran for the two points and Waurika was now in front, 42-14, with 7:45 to play before the half. Another Carnegie turnover resulted in Waurika’s next score. Gatlin Black scooped up a Wildcat bobble and took it to pay dirt from 40 yards out. Mora ran for the two-point conversion and the Eagles led, 50-14, with 4:45 still to play in the half. Wesberry’s second interception of the night set up the next Eagle score. Mora got his second score of the game on a 41-yard rushing touchdown. Bryant ran for the two points and the Eagles had a 58-14 lead with 2:27 left in the quarter. Another turnover by the Wildcats sealed the mercy-rule fate for Carnegie. Waurika recovered another fumble to give the Eagles the ball at the 23-yard line. A couple of plays later, Brown made his way into the end zone from one yard out. The run for two points failed, but Waurika had a 64-14 lead with just 57 seconds left in the half. Carnegie’s last drive of the night was ended in the final seconds when Kevin Garcia got another interception and ran out the clock on the return. Working with a short field much of the night did not produce very many impressive statistics. Brown was the leading rusher with 82 yards on just five carries. Mora was effective in the passing game with four completions on just six attempts for 71 yards. 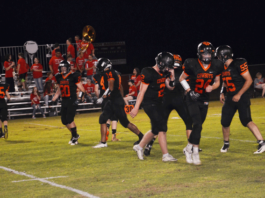 EAGLE FLIGHTS: The 64 points scored is the second highest total by a Waurika squad since the Eagles began eight-man play in 2012….The 64 points is tied for ninth highest number of points scored in school history….Waurika has not scored more than 64 points in a game since putting 80 on Fox in 2016…Carnegie has never beaten Waurika in three meetings with the Eagles….The 50-point margin of victory eclipses the 49-point winning margin against Carnegie in the first meeting between the schools in 1996…The 3-0 start is the best for Waurika since 2015, but it is only the second time since 1997 the Eagles have started a season with three straight wins….Waurika has started 3-0 only 14 times in 99 years of football….The Waurika defense has scored at least one touchdown in all three games this season….The 14 points scored by Carnegie are the first points allowed by the Waurika defense this season….Waurika has ended each of its first three games at halftime. WAURIKA: Rushing – Brown 5-82, Mora 8-63, Kevin Garcia 4-22, Bryant 4-10; Passing – Mora 4-6-71-0; Receiving – Wesberry 2-57, Bryant 1-10, Edwin Garcia 1-4. You might expect when a sports writer is asked to write a tribute to someone the focus would be on that person’s accomplishments as a coach or player. But, this article will be focused more on the person than his accomplishments. Last week a large crowd gathered at Ryan’s First Baptist Church to say goodbye to legendary Ryan coach and principal, Raymon West. his contribution to the lives of people went far beyond the football field, basketball court or baseball diamond if they were tasked with writing a tribute. As Bro. Mark Kunkel, pastor of the First Baptist Church of Terral, said numerous times while conducting the service, everyone was mostly there to honor the man Mr. West and not Coach West. However, well over half the crowd identified themselves at one point in the service as having been coached by Coach West. And certainly his coaching ability is not to be overlooked, but each person who has come under the influence of Mr. West would probably be quick to agree with Bro. Kunkel and this writer that his greatest achievements were what he poured into our lives. You see the goal of Mr. West was not really to produce great athletes – although that did happen. His goal was to prepare high school students for life. And, for the most part he was a master at teaching life lessons. Mr. West was tough. He was a disciplinarian. However, he correctly knew that making life a bit difficult in the athletic arena would serve each person well when they began to tackle life as a young adult. And, some of those lessons not only served us well as young adults, but throughout our life time. As was noted in the funeral service, Mr. West cared deeply for people. He endeared himself to most every athlete he ever coached and those he taught. The compassion Mr. West had for people carried over to his retirement years as he served people through his church and was frequently present when a need had to be met in the community. 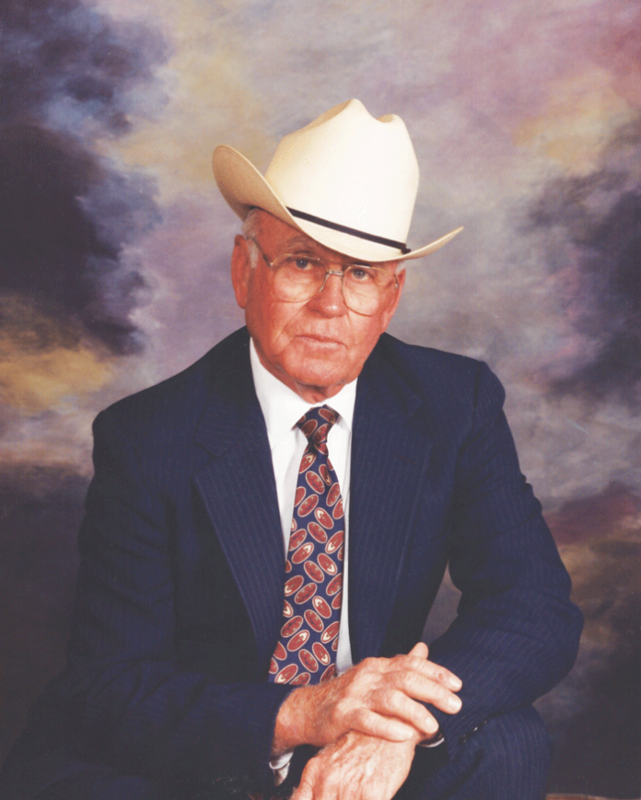 Everything Mr. West did was with great passion – his family, ranching, teaching and coaching. Mr. West’s accomplishments in the coaching profession should not go without mention. He was inducted into the Oklahoma Girls Basketball Coaches Hall of Fame in 1988. Most everyone knows he coached the 1965 Cowgirl squad that won the Class B state championship – the only state title in school history. He coached the Cowgirls for a total of 13 seasons. He coached the Cowboy basketball team for 15 seasons and took the 1962 squad to the state tournament – one of only two boys’ teams to advance into the state tournament. Mr. West’s contributions to the football program are more notable than most people might think. He coached football on three different occasions – in 1958, 1962-1963 and 1977-1980. The 1962 squad just missed out on a district title and finished 8-2 which tied the 1929 football team for the second most wins in a season up to that time. It is likely that one of the key decisions made by Mr. West while serving as principal and head football coach at Ryan was moving from 11-man football to eight-man football following the 1977 season. The decision probably saved the football program and he coached the Cowboys to the playoffs in the first year of eight-man football. Mr. West also coached baseball in the early years at Ryan. In the four sports coached by Mr. West, he led squads to 14 conference championships, three county championships, seven bi-county championships, 10 district titles, three regional crowns and one state championship. No tribute, however, would be complete without personal stories because Mr. West had a profound impact on my life. Late during my eighth-grade year and Mr. West’s first year back at Ryan after having coached at Burkburnett, Texas and Duncan, he noticed right away that my athletic genes were just about non-existent. Mr. West came to me and asked me if I would be interested in being the student trainer, which I did after football season that year. He sent me that following summer by bus to Baylor University to attend the National Athletic Trainers Association annual convention. I was definitely way out of my league (can you imagine a kid who just completed eighth grade going on a trip like that alone? ), but I learned a few things and spent the rest of my high school days helping with all sports. Mr. West saw potential in me that I did not see in myself and giving me that responsibility helped me stay connected to sports. As you can imagine we spent a lot of time together during basketball practices. During that time I learned a lot about basketball, but did not fail to pick up one or two life lessons along the way. One of those came one afternoon after Ryan had suffered a loss in a game that was not well-officiated. And, as I have a tendency to do even today, I was griping about how poorly the officials called the game the night before. That little tidbit has remained with me through the years and has been invaluable in my life’s journey. In the years following whenever I would make my way to Ryan I would try to make sure I came in contact with Mr. West. A side note – most anyone coached by Mr. West were all afraid to ever call him anything but Mr. West or Coach West. It was always difficult to address him as “Raymon.” But, that is the kind of respect he commanded and deserved. Many others and in particular his family could share similar stories about how Mr. West impacted their lives. 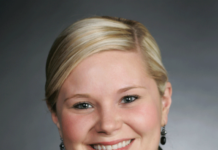 I am just fortunate I had the opportunity to be the one to write this article. I believe it is pretty easy to come to one conclusion – there will never be another Raymon West. 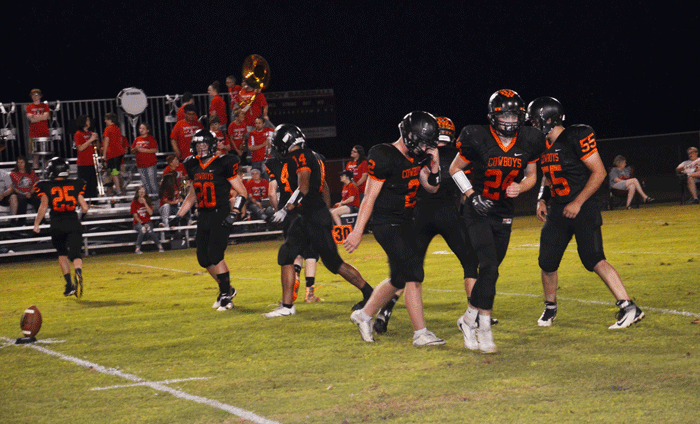 It has not happened often, but for the second straight week to open the season the Waurika Eagles’ flexed their defensive muscle in shutting out their opponent. The Eagles rolled to a 52-0 victory over Grandfield last Friday night at Cy Sloan Stadium. Waurika has opened the season by shutting out the two opponents and that has not happened since the 1975 season and it has only happened eight other times since Waurika began playing football in 1919. The defense will likely get a much tougher test Friday night when the Eagles travel to Carnegie to battle the Wildcats. Carnegie did not play last week and comes into the contest with a 1-1 mark with a loss to Seiling and win over Mountain View-Gotebo. In last Friday’s contest, the Eagles got off to a slow start with only a single score in the first quarter. Kevin Garcia busted loose for a 30-yard scoring run and Waurika was up 6-0 with 4:03 to play and that is how the score stayed for the remainder of the first quarter. The Eagles got things going, however, in the second quarter as they exploded for 46 points in route to ending the game at the half because of the 45-point mercy rule. Turner Mora opened the scoring in the second quarter for the Eagles with a six-yard rushing touchdown. Mora added the two-point conversion giving Waurika a 14-0 advantage just 31 seconds into the second quarter. Colton Bryant became the third Eagle to score as he scampered 20 yards for a score. 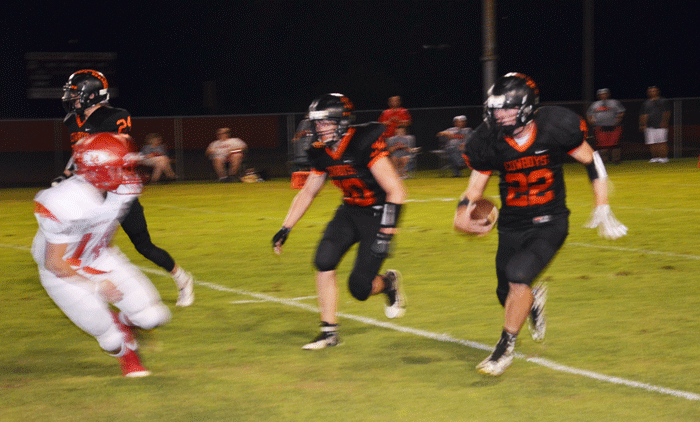 The two-point conversion run failed leaving Waurika with a 20-0 advantage with 9:22 to play in the first half. The Eagles took to the air for the next score with Hunter Wesberry catching a 28-yard touchdown pass from Mora. Bryant ran for the two points and Waurika had opened a 28-0 lead with 8:32 left before intermission. Mora got his second rushing touchdown of the night for the next Waurika score. Mora covered 13 yards for the score and Wesberry converted the two-point conversion and Waurika was pulling away at 38-0 with 6:04 left in the half. The next score came on the defensive side of the ball as Bryant picked off the Grandfield quarterback on the ensuing drive after the Eagle score and raced 30 yards for the touchdown. Bryant ran for the two points to put Waurika on top, 44-0. The final score came just 29 seconds before the half as Bryant galloped 78 yards for the touchdown. Matt Arriola ran for the two points to fashion the final margin. Thanks to that big run, Bryant ended the night with 102 yards rushing on only four carries. Mora was effective in the passing game with five completions in six attempts and 143 yards. Garcia caught two passes for 85 yards and Bryant added two catches for 30 yards. Wesberry had the other catch for a touchdown. 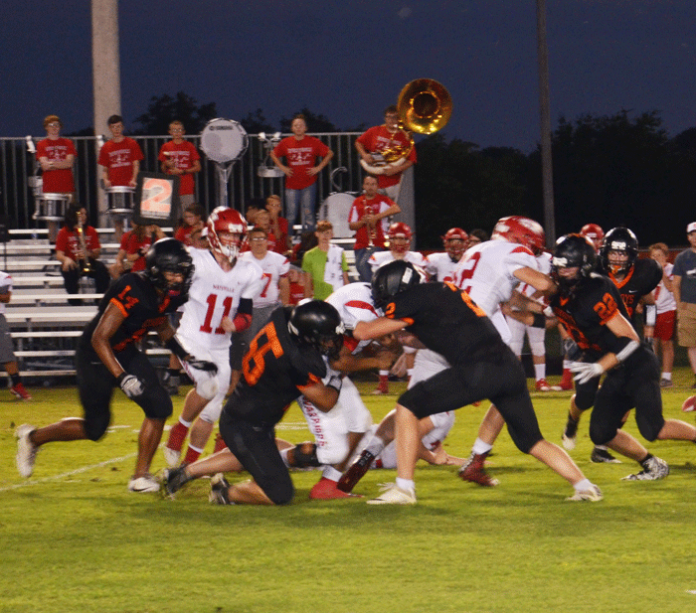 The Waurika defense held Grandfield to only 88 total yards on the night. 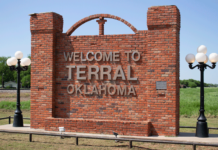 EAGLE FLIGHTS: This was the 40th meeting between the two schools with the first meeting coming in 1922…Waurika’s win over Grandfield narrowed the series margin to 18-19-3…The 52 points scored by the Eagles equals last year’s total in a 52-6 victory over the Bearcats….The 52 points is the most ever scored in a game against Grandfield….The 52-point margin of victory for Waurika is the largest ever against the Bearcats and is also the largest margin of victory by either team in the 40 meetings between the two schools…The previous largest margin of victory against Grandfield was 47 points in a 47-0 victory in 1939…Waurika is 2-0 for only the third time since beginning eight-man play in 2012….The back-to-back wins over Grandfield had not been accomplished by Waurika since the 1968 and 1969 seasons…The Eagles and Grandfield have only played each other five times since the 60’s….The back-to-back shutouts posted by Waurika is not a frequent thing – it has only happened twice since Waurika began eight-man football in 2012…Back-to-back shutouts at any point during the season has only happened 27 other times in school history….The most consecutive shutouts in a single season by Waurika came in 1933 when the Eagles recorded eight straight shutouts on the way to an 8-0-2 record.